Putting the FU in fun. Right-click menus for redesigned Facebook using Firefox! With the recent redesign of Facebook, I’ve been getting questions regarding whether the add-on for Firefox is compatible with the newly redesigned version of Facebook. After confiming over the last couple weeks with some of the ~500 daily users and the 2,000+ downloaders who have shared emails, the current version of UltimateFacebook is not only fully-compatible with Firefox 3 (and naturally Firefox 2), but also with the newly redesigned version of Facebook. Install it by clicking here. UltimateFacebook added to Softpedia and certified 100% Clean of Spyware, Adware and Viruses! Woot! Got an email from the folks at Softpedia! They’ve just added and reviewed UltimateFacebook, the Mozilla Firefox add-on that makes using Facebook easier and more fun. It’s beed certified to be 100% Clean of spyware, adware and viruses. Very cool. With several 1,000 people now using the add-on, it’s cool to see the social graph grow from the my graph of 200 or so friends in May to almost over 900,000 Facebook users in the graph today. Facebook Right-Click Menu for Firefox. Make Facebook WAY easier to use! So over the last several months I, like tens of millions of people, have been using Facebook to find and stay in touch with friends and my biz network. As I used it more and more, I became more annoyed with how long it would take me to send messages, write on walls, etc. So I’ve written a Firefox add-on to make that easier. Called ‘UltimateFacebook,’ all you do is right-click a hyperlinked name in a news feed or a person’s profile image/thumbnail and a menu will appear. 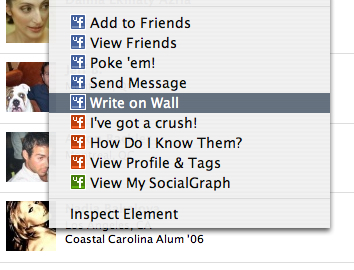 You can now send messages, write on walls, poke users and add or view friends with 1-click instead of the 2-3 it normally takes to get to the page to normally do the action. I’ve been playing with it for the last several months and have had about 300 people helping me test it. It’s rather stable at this point, but is an alpha product. Holler with ideas and/or feedback, but definitely try it out. Click here to read more and try the add-on!